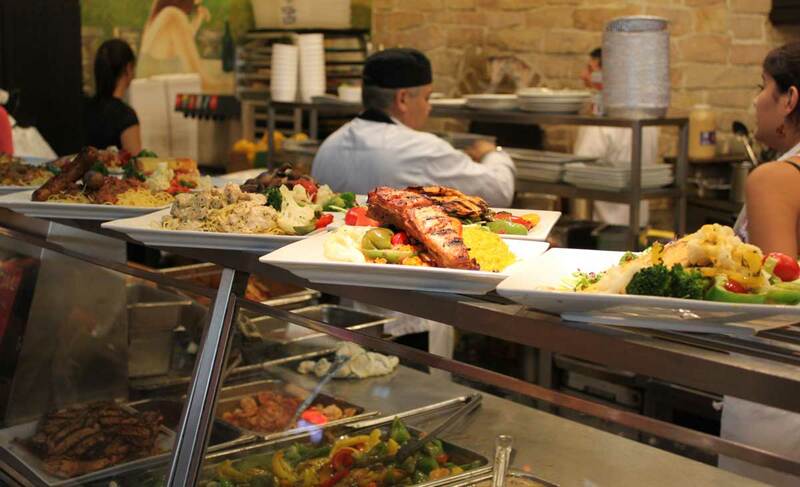 Real dishes in food courts — can it be done? During lunch hour, Montreal’s downtown food courts are filled with thousands of people eating lunch — almost all of them on Styrofoam plates. The meal lasts a few minutes but the Styrofoam stays in the landfill for hundreds of years. Yet there is one major shopping centre just off the island that has switched to reusable dishes, cutlery and glasses. In November 2009, Carrefour Laval inaugurated a fully renovated, redesigned food court (or “Dining Terrace”) that incorporates a number of green initiatives — including the use of real dinnerware and cutlery. The dish service is run entirely by the centre: food court staff bring the used plates, bowls, cups, glasses and cutlery to a giant dishwasher, and then back to the food court’s vendors (17 fast-food restaurants and 8 specialty food stores). 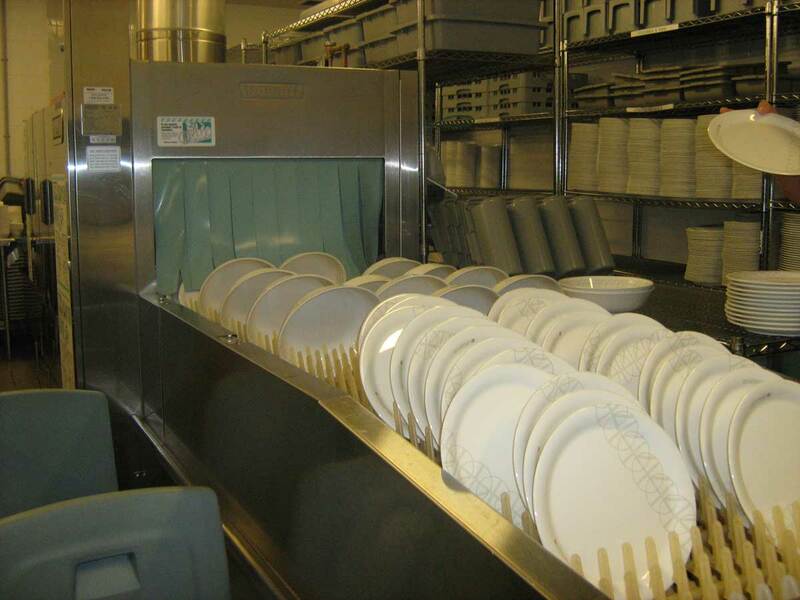 Carrefour Laval's giant dishwasher can clean 14,000 pieces of dinnerware per hour, using only 25 ml of water per dish. Photo courtesy of Carrefour Laval. In fact, Cadillac Fairview, the company that owns and operates Carrefour Laval, has incorporated the concept into its revitalization of the Toronto Eaton Centre, currently underway. It is also considering implementing the model in some of its other Montreal-area centres. Back in Montreal, most food court diners are still eating off of plastic or Styrofoam plates. But at least one food court is trying to integrate reusable dishes. At Carrefour Industrial Alliance located on Ste-Catherine near Metcalfe, nine of the food court’s 20 restaurants use real plates or bowls. It’s a policy encouraged by the administration, although the individual restaurants are responsible for buying and washing their own dishes. 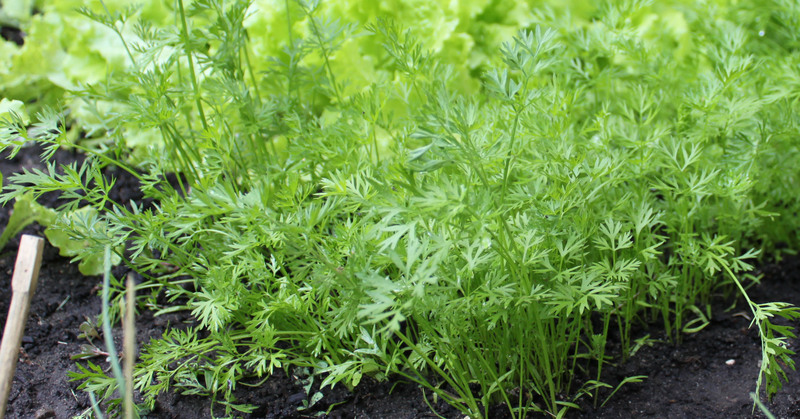 “Originally, the idea was to use all reusable dishes, but it would have been much too expensive,” explained Myriam Clouët des Pesruches, Project Manager at Ahern Real Estate Corporation, which manages Carrefour Industrial Alliance. “So instead of making it mandatory, we opted for an individual approach.” Restaurants that choose to use reusable dishes are helped out by the food court’s cleaning staff who are instructed to help collect the dishes, scrape them off, and bring them back to the restaurants. Clouët des Pesruches estimates that using reusable dishes has reduced the amount of garbage produced at the food court by half. Fiore Bistro, at the Carrefour Industrielle Alliance food court downtown, has been using real plates and cutlery for 11 years. Yes, it’s costly, says Baioumy, and yes, they lose some plates and cutlery because of breakage and theft. But he believes it’s worth it. “People come back to us for the quality of our food and the service,” he said. He adds that real dishes are not only better for the environment, but they’re cleaner — straight out of the dishwasher. While most diners interviewed said they chose their meal for the food, not the type of plates, “it can influence my choice,” said customer Noémi Lamarre, who works downtown. She eats in food courts often, and would like to see more establishments using reusable dishes. One visitor from Switzerland seemed to find the whole fast-food court set-up odd, explaining that where he comes from you just find individual restaurants, and always real dishes. Clouët des Pesruches says the costs of implementing a system like the Carrefour Laval’s would be far too expensive for their restaurant tenants. But she does not exclude the possibility entirely. “If we can find a solution that is manageable in terms of costs, we will consider it,” she said.